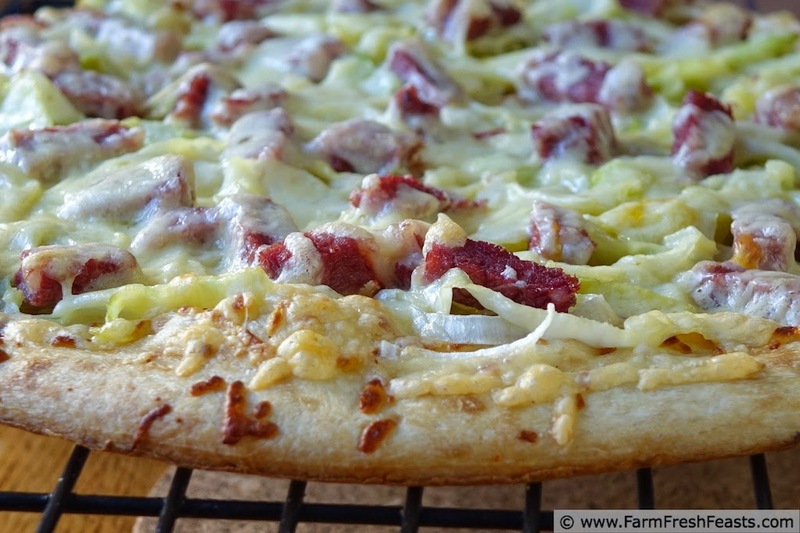 A St. Patrick's day pizza: corned beef & cabbage smothered with creamy Irish cheese. I will probably be all over the place in these notes, so I apologize in advance. Squirrel! At least I'll try to break them up with official-looking subheadings. 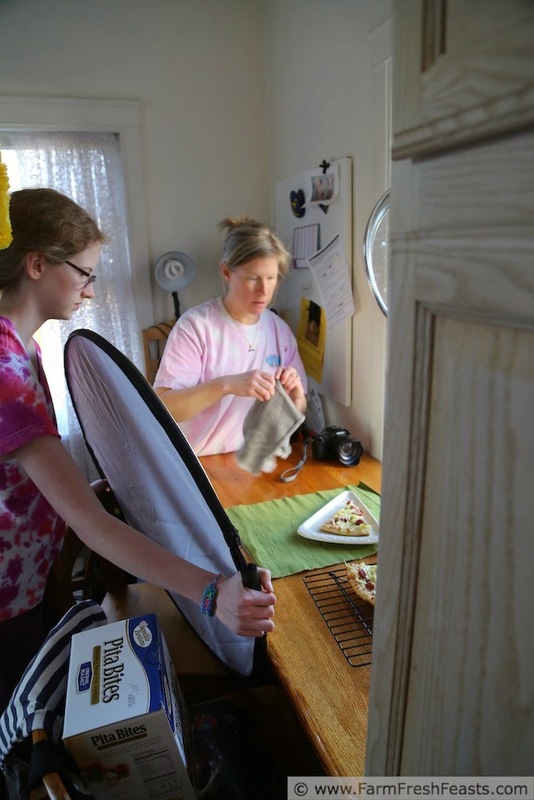 Since we eat pizza every Friday--and some Sunday afternoons while I'm working on shooting recipes for my first-in-a-series pizza ebook--food holidays are a great way to explore new flavor combinations. 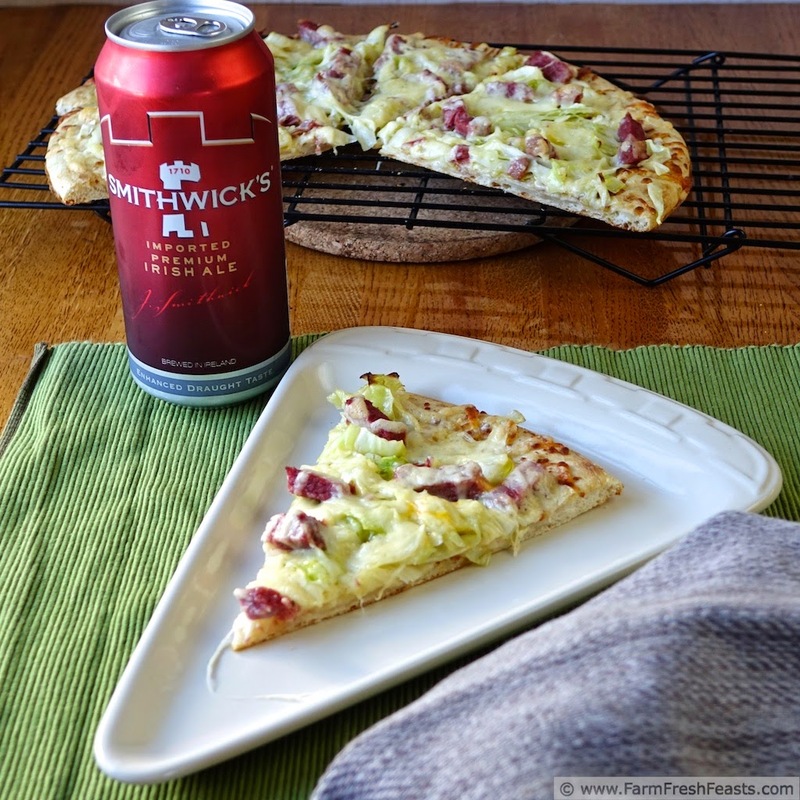 We've enjoyed 'Tremendously Green' cabbage and potato pizza and Irish cheddar, chicken, leek and potato pizza already, so I thought a corned beef & cabbage pizza was the next logical step. I like how this Irish cheese melts, so that addition was a no-brainer. After my spouse returned from Afghanistan he bought a camera. While he was deciding if it fit his hand, I'd attempt to use it for photos. Once he determined that it wasn't right for him, he'd return it and buy a different one. He repeated these actions over the course of the winter, eventually settling on one. [The camera that I am still, a year later, attempting to use for photos!] The common thread--through the camera shopping and the marriage--is that I adapt to whatever works best for him. Adaptability is an excellent trait in a military spouse. On the day I made this pizza we happened to have 2 cameras in the house--and a hungry assistant eager to get the photos taken so she could dig in. My spouse was using the new camera to take photos of me doing my thing with the previous new camera. The distraction is probably why I left an unfolded napkin in the corner of the photo, but at least it provides a place to overlay the recipe title. Don't ask me which cameras he went though before ending up with his final choice. It doesn't matter because it's not the camera that takes a great photo, it's the person pushing the button. 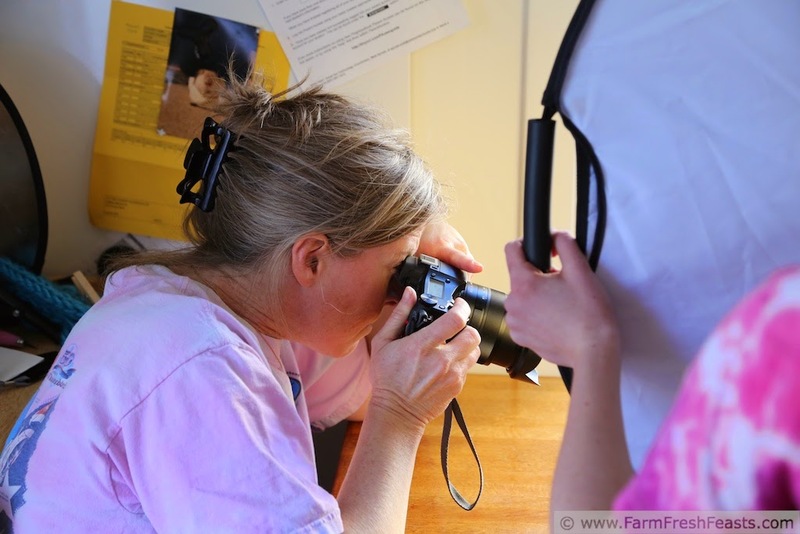 Whatever fits your hand and is easy for you to understand and use is the right camera for you. The brand name, the numbers on the lens--they are secondary to how it feels to you. Just make sure that something in the photo is in focus! There's no reason to have digital photos that are blurry. It's pizza, not a gazelle bounding away causing you to snap quick before the moment is gone. I realized that there are an awful lot of brand names visible in these photos. Thanks to my spouse's hard-earned money I was able to buy everything at a variety of stores, and I'm choosing to share what I bought because the items worked really well in this recipe. There are plenty of times that I'm just not that into making pizza dough in advance, nor do I have any pizza crust yeast (Amazon affiliate link) to make a fast dough. I've tried a bunch of prebaked crusts and know what we like best. Use whatever products work best for you. 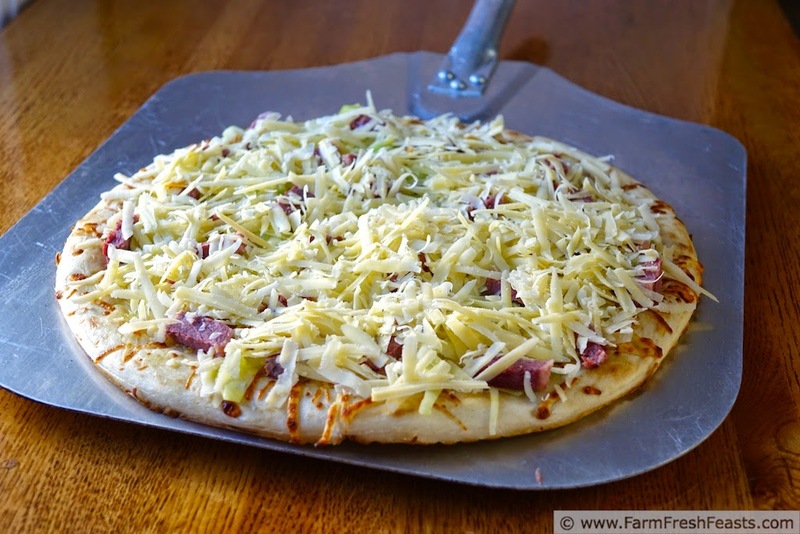 For other St Patrick's Day-inspired or 'any random day' pizzas, please see my Visual Pizza Recipe Index. 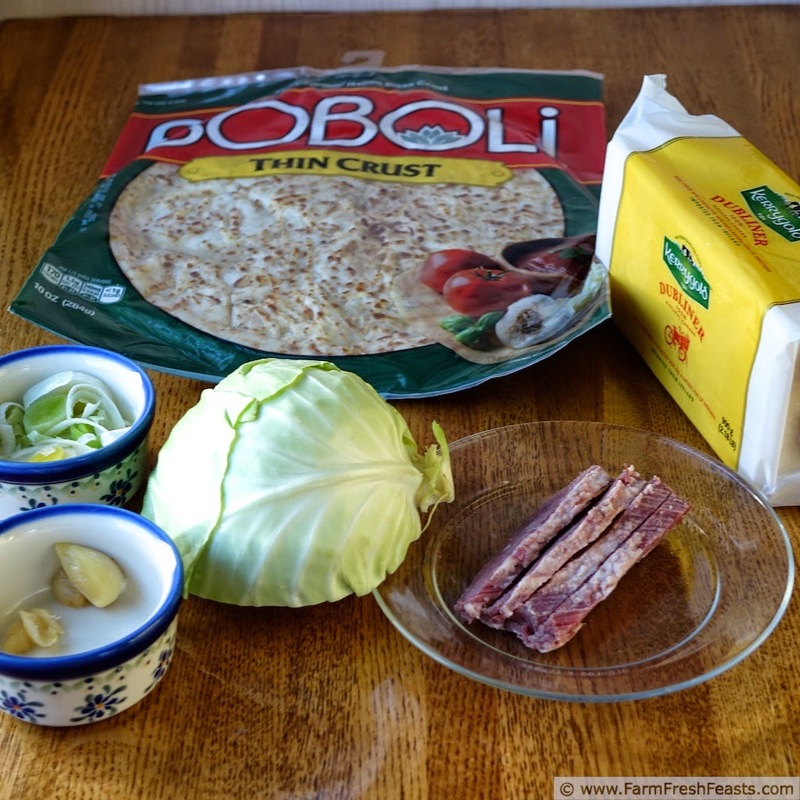 For other recipes using cabbage, please see my Cabbage Recipes Collection. For other recipes using leeks, please see my Leek Recipes Collection, part of the Visual Recipe Index by Ingredient. Preheat oven to 425 degrees Fahrenheit, and if you like homemade pizza please invest in a pizza stone. It will pay off with excellent results that keep you heading back into the kitchen to make more pizza. 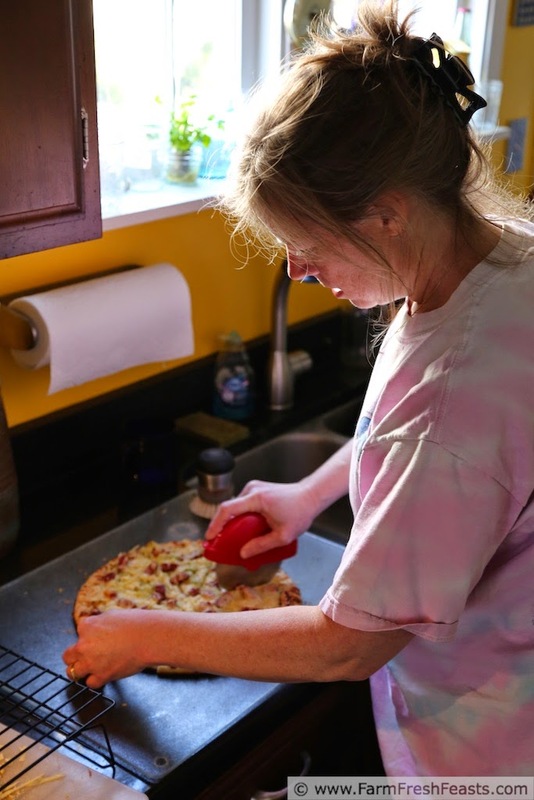 There's an Amazon ad in the sidebar with an image of my pizza stone--I've had it for years, it's broken, and it still works like a charm to create magically delicious pizza. Add 1 to 2 Tablespoons of oil to a small dish, and mix up the roasted garlic with it. Set aside. Preheat a medium skillet over medium heat and add about a Tablespoon of oil. Sauté the cabbage and leeks until wilted, about 5 minutes, but remove from heat before they brown. Set aside. Now, this is a really fun idea for pizza! Corned beef is usually abundant (and occasionally on sale) at the markets in this month before St Patrick's Day, so I like to buy a couple, cook them, and stash them in the freezer. 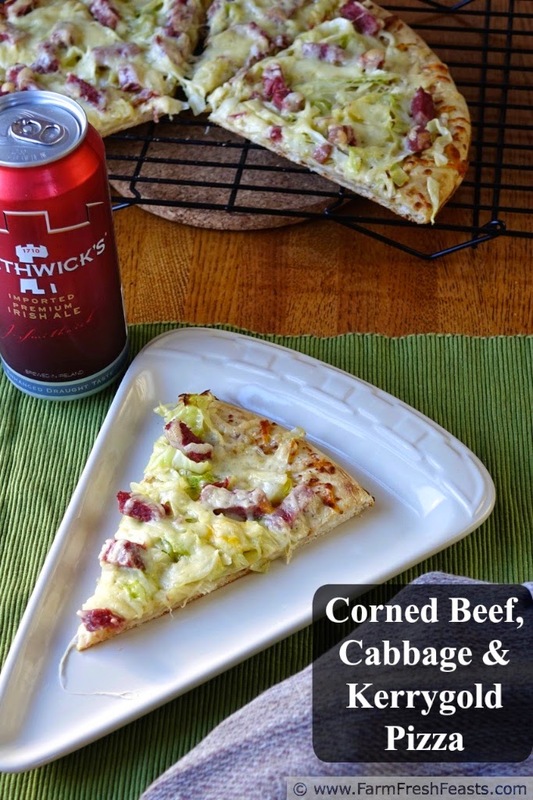 I never thought about a corned beef and cabbage pizza! Now that I'm starting to see the wall of the back of the meat freezer (from the cow we bought) I think I'll follow your advice and buy another one. We like the flavor of corned beef, I just never think to cook them outside of this season when they are every where. What a great idea for a pizza. Love all your behind the scenes shots! I, of course, can't take any credit for the behind the scenes shots--but I'm glad to have them as well. I've got a concept for an About page shot, similar to a mutli-armed Hindu goddess since blogging involves so many activities, but that will come later. What a genius idea for a pizza - so creative! I can't wait to try this recipe - it sounds delicious!! I don't know if it was genius or desperation but the flavors really play well together on this pizza. Adore your pizza -- just absolutely perfect. I so rarely make photogenic food, it's nice when one turns out OK. I'm pretty sure my Hubby is the one adapting, although I do have to be ok with his school work all over the dining room floor when he's here on weekends. Maybe we're both adapting. Damn you take amazing photos with your iPhone. Mine turn out . . . . flat. I would think that the cats would walk all over school work on the floor, but then Oscar will go wherever he wants so I suppose it doesn't matter.